I’ve written before about my experiences with GUMSHOE, and how it’s gone over with people I’ve run it for. Not well. GUMSHOE has three things I love: a solid info delivery mechanic, example mysteries & advice, and great settings. I love Esoterrorists, Ashen Stars, Night’s Black Agents, Fear Itself. I dig how these games frame mysteries in different ways: classic monster hunting, mercenary problem solving, conspiracy revelation, and as a means to survive. There’s so much good stuff there. But I finally think GUMSHOE’s not the game for me, even with adaptations. These games and settings would have rocked my world fifteen, even ten years ago, but today. A couple of months ago I wrote about doing an “Express” version of GUMSHOE. I hoped that might hit better than my previous attempts. A couple of weeks ago I pulled the trigger and ran two sessions of Mutant City Blues with a stripped down system. I had a good time, but it was in spite of the system, rather than because of it. We recorded the sessions so you can watch those (Session One, Session Two). You can see my character spreadsheet and other materials here. In this version, categories have a pool of points players spend from, rather than individual abilities having them. I understand Cthulhu Confidential does something like this. Each category has five abilities. Players choose which abilities they actually know. You can see on the sample characters some abilities are greyed out meaning the PC doesn’t have access to them. On the other hand, I marked abilities in red if only that player knew it. I worked out the ability distributions to create parity across all four characters. General abilities remained largely the same. I collapsed a couple and moved Hit Point-type abilities up to differentiate them. 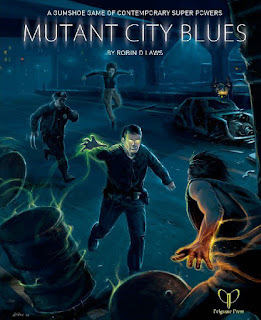 Mutant City Blues has powers, something I’ll come back to. I reduced their rules text as much as possible for the pre-gen power sets. I associated Investigative Powers with one of the three groups. Any spends come from that pool. Other powers have their own ratings, like general abilities. Cutting: Reducing the ability list worked. It made picks easier and it meant that everyone had some strengths. It removed the “never going to use this ability” problem. We could also spot particular abilities slightly faster. But I’m generally liberal with my “skill interpretations.” If players can make a decent case for using something in a situation, I’ll allow it. That’s easier, but I recognize that it undercuts games with tight skill definitions. My “Express” approach plays more into my style. Building: I put serious time into building the pre-gen characters. I tuned those to the adventure once I’d settled on it. To do that I created four basic templates with different ability scores. Players then picked from one of seven different power sets. Pre-building them for easy to cut & paste made the CC process easier. I could also make sure each power set felt different. You need that in superhero games. 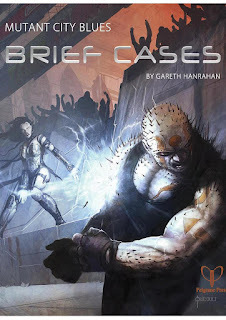 Running: I ran Garath Hanrahan’s adventure, “Blastback.” That’s from Brief Cases, an excellent collection. The adventures there are stronger than the sample from the core book and the Hard Helix collection That may be because they’re intended for one-shot play. Each adventure has a focus and is clear what kind of session you’re getting. My pick has a front-end investigation with a couple of different directions. That likely leads to a final scene which has more conflict, though players could defuse or circumvent that. Resolution: I’ve mentioned before my home group’s reaction to GUMSHOE’s general resolution mechanic. (They didn’t dig it). That system boils down to d6 + whatever you spend from your specific ability’s pool before you roll. Base difficulty is a 4, but it can go higher. At first glance it ought to be something I like: when you call for a roll, it’s clear what you need to roll. It also has a little push your luck mechanism. But it still lands with a thud for me. Many, many smart people dig it. It just doesn’t have my kind of umph. I love push your luck, but here feels unsatisfying. 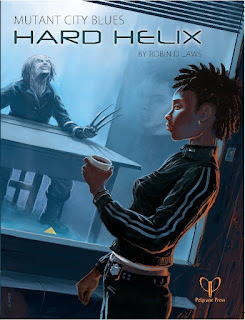 Fate, Mutant Year Zero, Action Cards, all make that PYL an interesting choice. You get to judge results or count cards. Here, even if you know the difficulty (not the default mode), it remains a crapshoot. We didn’t have that many general ability checks in our online session, so it wasn’t a big issue. But it remains a sticking point for me. Powers: I love the idea of superhero police procedural. Top Ten and Gotham Central consistently knocked it out of the park. Mutant City Blues tries to find a middle ground between those two: powered detectives with a gritty backdrop. That could work, but it knocks up against what I want out of superhero game. We have two issues. First, the powers themselves. Supers games have two choices: effect descriptor base or power list base. They can tweak this (see BESM and M&M 2e). MCB doesn’t tweak its power list approach. They’re set, strongly defined, and strongly delimited. That last point’s one of the problems. A GM can run these more flexibly, and there’s some advice about that in the rules. But the system doesn’t support that well- if you make something flexible, you run the risk of overlapping with other powers. Not overlapping’s the point of how the powers have been defined. They’re also, unless you invest the majority of your points in something, pretty weak. They look good at first glance, but the pool costs can be crazy. Force Field’s a good example of this. Which brings us to the second problem, the Quade Diagram. I love the idea of it: powers fall into groups and common connections. You can use that in dealing with mysteries and it forces interesting character creation choices. But despite the emphasis put on it, it offers a limited range clues, especially in combination with the Investigative Abilities. You have to focus the mystery around that if you want it to be useful. Brief Cases does that with “The Kids Aren’t Alright” scenario. When you first read MCB, the Quade Diagram obscures the setting’s other forensic tools. I had to read it a couple of times to see how MCB creates parallels to CSI (show and reality) techniques. For example: power residues can be linked up to powers (like DNA) and damage types can indicate power set (splatter analysis). That’s not to say the Quade Diagram isn’t solid and useful. Instead it’s that it doesn’t quite fulfil its promise. I think it could work, but perhaps in another context. We’ve seen at least one hack which uses it as a diagnostic tool and that’s interesting. Clues: The spend to get additional info mechanic requires experience to use. The GM has to model that behavior for a few sessions before players can become proactive. That means one shots and short run games have an artificiality. The GM has to stop off and ask for spends, creating a modified “Parrot Effect.” My shorter list of investigative abilities helps with that. But I haven’t gotten past it feeling directed rather than open. I suspect that’s a style disjunct for me. In the end, Mutant City Blues doesn’t fit with the way I enjoy running, despite the interesting setting. Here’s how I like to handle info gathering and investigative moments. The player says what they’re doing (casing a joint, talking to someone, researching details). We can do some talk and playing out to set things up or we can go straight to answers. I need to have a sense of their character’s approach and purpose. If they have appropriate competencies (skills, abilities, plan, equipment, support, access, whatever), I give them basic info, no roll required. Sometimes that’s what GUMSHOE calls a core clue, meaning it points to another scene or location. Players can then roll or not roll a test. If they choose not to roll, they’ve got the basic info and it’s taken the appropriate time. If they choose to roll, they’re taking a risk. They may cause a problem: take time, have to give up resources, alert the opposition, alienate someone. If they succeed, I’ll let them ask questions, usually 1 to 3. I don’t have a list like PbtA; instead the situation defines what they can ask. Sometimes I’ll say you can’t get that answer from this, modify what they can get, and/or ask for an explanation of how they might learn that. It puts some heavy lifting on the players, but feels more organic. It makes info finding more interesting and personal. If it occurs to me, I might ask the player if they want to trade in one of those questions for a benefit (take less time, gain a future effect, get a resource). I’m not completely out on the GUMSHOE Express idea. I think MCB wasn’t the one to start with. If I tried again I’d probably go with Esoterrorists or Ashen Stars. Likely the latter, since it hits a genre I haven’t found a grabber game for. I’d do the same thing with the investigative skills- reduced down to three sets, probably with fifteen total skills. For general abilities I’d probably go with something closer to Approaches from Fate Accelerated or emotional stats from The Veil. I’d want a short set of stats with narrow ratings (-1 to +2) for starting. For risky resolution, I’d have PbtA style rolls. Full success on a 10+, partial on a 7-9, and a miss on 6-. I’d write up ome moves to represent the basic actions (fight, manipulate, defy danger, etc). If I was doing Ashen Stars I would probably steal from Impulse Drive, but keep everything simple. That would include downplaying the cybernetics and viroware rules from Ashen Stars. Though they’re not as oddly scaled as MVB’s powers; it might be easy to model the upkeep with a move as well.